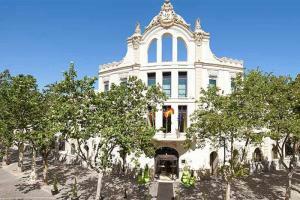 This impressive modernist hotel is situated within walking distance from the historical, cultural, and shopping center of Valencia, and is the perfect location for discovering the city. This exclusive hotel offers 135 guest rooms, combining a classic style with avant-garde technology, providing a warm and relaxing atmosphere in American art-deco style. Located just steps away from shopping and historical centers, and about 35 minutes from Valencia Airport. Komori - Japanese cuisine; Rosmarino Restaurant - Mediterranean cuisine; El Jardi Restaurant and Bar - Mediterranean cuisine. Music Palace, City of Arts and Sciences, Redonda Square, Bull Ring, Serranos Towers, Casino Cirsca, Botanical Gardens, Albufera Natural Park, Malvarrosa Beach.